Why invest in Yorkville real estate? Yorkville represents one of the most expensive areas in Toronto, and in Canada, to buy real estate, with market values consistently rising for several years. Local, national, and global buyers continue to seek out Yorkville, which has become synonymous with luxury city living. Indeed, foreign investors who already own real estate in New York, London, and Paris, now seek to own in Toronto as well. An investor in New York’s Manhattan will most likely want to invest in Toronto’s Yorkville real estate as each represent high end, blue chip real estate, as evaluated on a cost per square foot basis in their respective geographies. In addition, Cushman & Wakefield just released a 2016 report indicating that Bloor Street West’s ‘Mink Mile’ (stretching between Yonge St and Avenue Rd) commands an imposing rental rate of 250 USD per square foot, making it the most expensive retail in Canada. What is good Yorkville real estate? Are you interested in commercial or residential real estate? Is your goal to generate cash flow or long term appreciation? Do you prefer freehold or condominiums? If commercial, do you prefer office or retail? Your answer to these questions will determine the best Yorkville real estate to meet your goals given your budget. (2) Wealthy, established urban families and couples. Both demographics differ mostly in age and family status. Otherwise, they share similar traits, such as being highly educated with significant disposable income, and both groups either rent or own. Both groups will continue to demand high end retail and various luxury services, as well as luxury residential accommodations. The amount of construction and investment happening in Yorkville today is greater than it has ever been. Greybrook Realty Partners Inc. and First Capital Realty have partnered in the acquisition of 101 Yorkville Avenue in the heart of Yorkville. Over 45,000 sqft of multi-level commercial space lacking street level entrances will be demolished to make way for retail that will better attract luxury brands. First Capital Realty has entered into a binding agreement to purchase the 85,000 sqft One Bloor Street East retail podium in Toronto for $189.2 million in cash. The deal also includes 52 commercial parking spaces on-site. First Capital Realty is renovating its almost 237,000 square feet of commercial retail space, formerly known as Hazelton Lanes, into what is now known as Yorkville Village. Part of that renovation has included new access to Yorkville Avenue, thereby increasing its integration with the rest of the neighbourhood. Anchor tenants include Whole Foods, Andrews, TNT, Equinox Fitness, and Rexall Drugs. New luxury retail openings. Luxury retail brands continue to add their flagship stores to the Yorkville area. Recently, Christian Louboutin opened its Canadian flagship at 99 Yorkville Avenue. In several months, Chanel will relocate to an 8,700 square foot space at 98 Yorkville Avenue. Christian Dior will open a two-story flagship store in Chanel’s current location on Bloor Street West, and Italian luxury brand Moncler will open its third freestanding Canadian store at 131 Bloor Street West. Office condos. Up until now, there have been no office ownership opportunities in Yorkville and business owners have either rented their space, or purchased large Victorian homes to house their businesses. Two office condos are now available to purchase in pre-construction offering both small footprints and larger floor plates where a business can occupy one or more floors with direct elevator access. Tight Resale Market and New Condo Developments. Yorkville has seen an unprecedented increase in residential condominium developments in recent years. 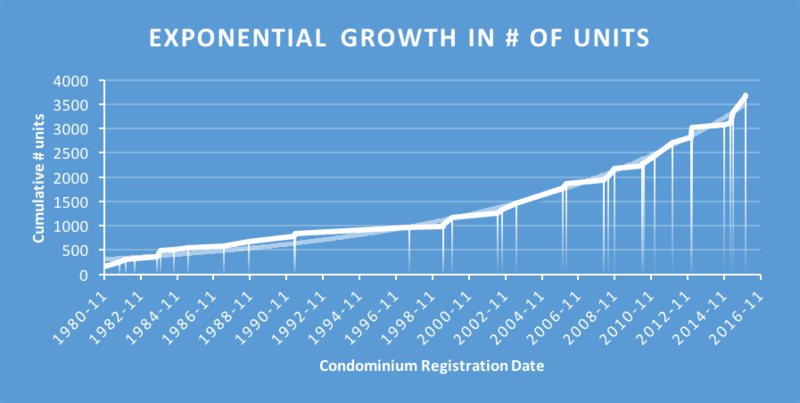 As many as 1,282 units were added to the Yorkville area from 2011 to 2016. The exponential growth in units can be seen in the graph below. Despite this increase, Yorkville is showing severe inventory shortage on the resale market with only ~ 2 months of supply, partly due to a small number of listings, and partly due to increased buyer demand. Thankfully, builders have pre-sold and are adding many more units to the Yorkville area. As can be seen from the table below, as many as 1,352 units will be occupied in 2016-2017. Nearly 3,000 units will be added by 2021. In addition to the foregoing developments, there are another 4600 units in the development and pre-construction stages that will further define the residential Yorkville landscape in the coming years. Rentals. Similar inventory pressures are being seen on the rental side, with fewer days on market for listings, and only 2 days of inventory. As you can see, there are many types of commercial and residential real estate opportunities in Yorkville, which is experiencing a high level of growth. As you plan your investment goals, if you want first hand experience of the Yorkville investment opportunities, we would be happy to schedule a consultative tour where we can visit the neighbourhood, view select properties that are for sale, as well as review today’s market trends and property sales data. This consultation will help you determine whether Yorkville is the right investment opportunity for you. We would be happy to meet with you at any time.